Firstly, we talk about ZenBook.What is ZenBook?! Zenbook (also known as ZenBook) are a family of ultrabooks – low-bulk laptop computers – produced by Asus. The first Zenbooks were released in October 2011, and the original range of products was amended and expanded during 2012. Models range from 12-inch laptops, featuring power efficient components but lacking connectivity and having only integrated graphics processors,to 15-inch laptops with discrete graphics processing units and optical disc drives. Most (though not all) Zenbooks use Intel Core ultra-low-voltage processors and Nvidia GPUs when integrated graphics are not used. Asus introduced new models with touch screens to take advantage of Windows 8 after its release in late 2012. Most models drew comparisons to the Macbook Air. The most recent release in the Zenbook line is the upmarket Zenbook Infinity UX301 series.The Zenbook mainly competes against computers such as Acer's Aspire, Dell's Inspiron and XPS, HP's Pavilion and Envy, Lenovo's IdeaPad and Toshiba's Satellite. There’s never been a laptop like the all-powerful, all-conquering ZenBook Pro 15. It’s faster and more sophisticated than ever before, and the jaw-dropping new ScreenPad™ adds magic to your creativity. With ZenBook Pro 15, you don’t have to wait for the future: you can touch it, right here and right now. Hewn from solid metal, the thin and light ZenBook Pro 15 is a masterpiece of design and engineering. Its elegant looks and sophisticated finish hint at the awesome power within,without shouting about it. Let ZenBook Pro 15 be your inspiration. 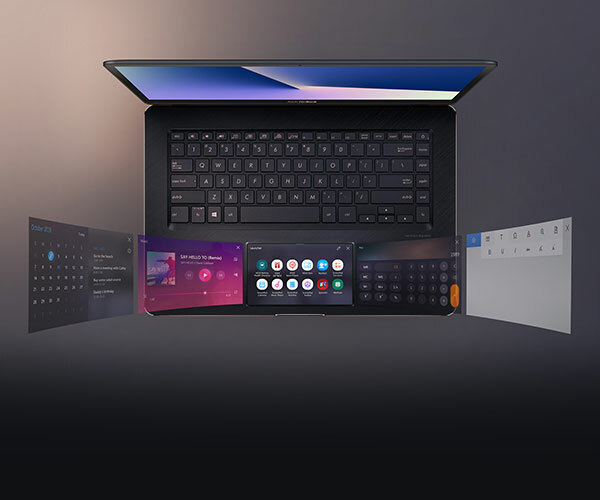 ASUS ScreenPad™ is the new and revolutionary way to interact with your laptop, and a quantum leap in the evolution of the familiar touchpad that’s been around since 1992. ScreenPad™ combines the functions of a standard touchpad with a high-resolution LCD touchscreen, giving you a secondary interactive display with endless possibilities. You can run special ScreenPad™ Apps entirely within ScreenPad™, putting useful tools and controls — such as a calculator or music player — right at your fingertips. ScreenPad™ can also work in an adaptive mode with desktop apps, with features and tools that change automatically according to the task in hand. There’s also a full software development kit available, so developers can create and expand the incredible possibilities. With ScreenPad™, your laptop becomes your intelligent partner, helping you work more efficiently — and more enjoyably! Screen Extender mode turns ScreenPad™ into a powerful multitasking partner. 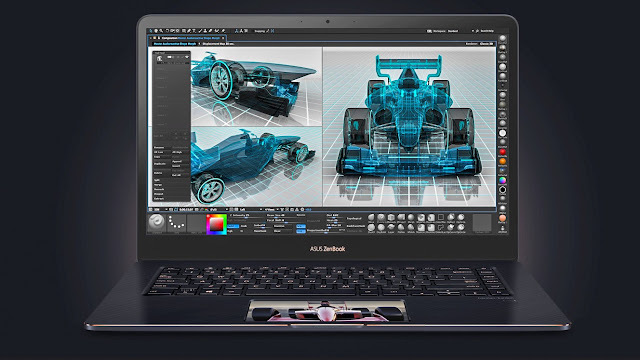 You can extend your laptop's screen onto ScreenPad™, giving you a dual display in one device. Use it to keep an eye on your social media or email, or as a handy preview screen — the possibilities are endless! To change ScreenPad™modes, just tap the f6 key to cycle between ScreenPad™ mode, Screen Extender mode and Touchpad mode. Packed with state-of-the-art components, ZenBook Pro 15 is built to handle anything you can throw at it without a fuss. It’s capable of shaming many desktops, and its high-performance processor, ultrafast storage and gaming-grade graphics let you blitz through the most demanding tasks faster than ever before. ZenBook Pro 15 will never keep you waiting. With ZenBook Pro 15 and the ASUS Pen you can really let your creativity flow. The ASUS Pen can detect even the most minute pressure variations — in 1,024 steps from 10g all the way up to 300g. It also exceeds the industry accuracy standard, so you can hold it at angles of up to 45° without affecting the quality and placement of the lines you draw. With the ASUS Pen — or any other active stylus — you can jot down your thoughts, annotate diagrams or sketch out your creative ideas in an intuitive way with a natural, responsive feel. A laptop as powerful as ZenBook Pro 15 deserves an exceptional keyboard. The backlit keyboard is designed with extra-long key travel for comfortable, accurate typing. ScreenPad™ also works as a great touchpad that’s cleverly engineered for maximum comfort and accuracy, with a glass covering for smooth control. It features palm-rejection technology for ease of use, and supports multi-touch gestures and handwriting input. Accessing your ZenBook Pro 15 couldn’t be easier or more secure, thanks to Windows Hello technology and the fingerprint sensor built into the touchpad. Now there’s no need to type in your password every time to log in — a single touch is all it takes. 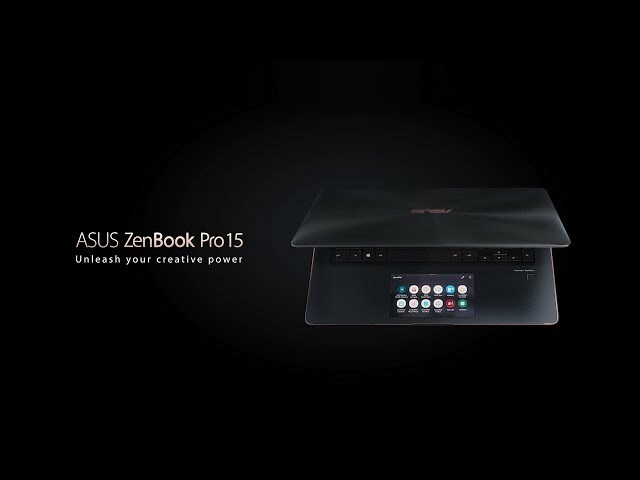 Searching for power outlets isn’t a productive use of your time, so ZenBook Pro 15 uses a high-capacity battery and clever ASUS thermal engineering to give you all-day on-the-go autonomy. But when you do need to recharge, it shouldn’t take forever: that’s why the fast-charge technology in ZenBook Pro 15 lets you recharge to 60% capacity in just 49 minutes.